What do you get when you bring together one of the comic book industry's most prolific writers with an artist fresh from a legendary run on 'Batman'? The result is 'Reborn,' a creator-owned title from Image Comics that is one of the most auspicious debuts of the year. A sci-fi, fantasy, epic that slowly burns a fuse that takes off like a rocket. It's a summer blockbuster film for the fall. Bonnie Black is an elderly patient on the brink of death. She opens the narration on the story as she reflects on her life, all the loved ones she lost and accepts her fate. It's reminiscent of the opening of the animated film "Up," where the elderly man's life with his beloved wife is chronicled in such a heartwarming and heartbreaking montage.It's not as sentimental as that but still powerful in its own way, as she embraces the last moments of her life with such clarity and dignity. Mark Millar has set us up nicely, bringing a compelling and emotional protagonist to sympathize with before blowing our freaking minds. Bonnie believes there's no magic figure in the sky waiting with open arms to welcome her into some kingdom among the clouds. At the moment of her passing, it was as she described, "Like a light being switched off." Except it wasn't that simple. What follows is an exhilarating science fiction fantasy epic in the truest sense. The reader is catapulted onto the battlefield amid an ongoing horde only to find a reborn Bonnie, young and regal, being welcomed as a savior. Awed and gobsmacked by this new reality, Bonnie has retained her memories and awakens to a new life with some familiar faces. This is Millar at his best, a lean bit of storytelling magic, without a wasted scene or line of dialogue. But it's not all in the service of the plot, it also develops Bonnie as a person while propelling us forward into this new fantastic realm. Greg Capullo's distinctive clean lines and dynamic layouts are in full display in his first post-Batman series. 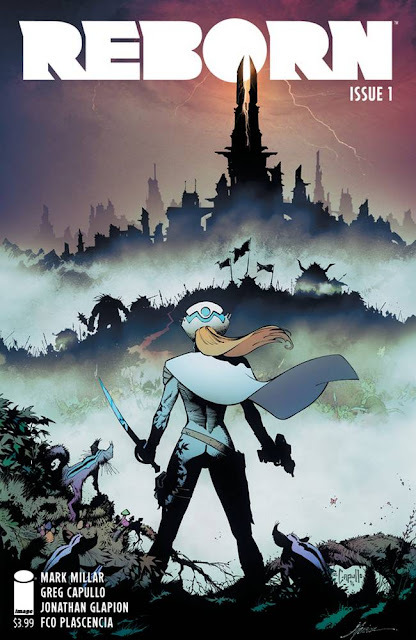 Capullo does a wonderful job of building the normal everyday reality of Bonnie as she recounts her life before breaking out in a wondrous open fantasy world near the end of the issue. He deftly injects plenty of detail from scene to scene in the background and character designs until he lets loose as Bonnie awakens in the "afterlife." FCO Plascencia's colors make the transition from subtle toned-down hues of Bonnie's past and present before exploding in lush bold bright colors of her new reborn world. The art goes from excellent and precise to extraordinary and cinematic. 'Reborn' is one of Millar's most disciplined works with a laser-focus on creating a new fantastic world through the eyes of a wholly conceived character. Paired with Capullo's amazing art and Plascencia's bold color scheme, Image's new series is a blockbuster, steeped in mystery and high in concept, 'Reborn' is an adventure worth getting invested in. Needless to say, this is a must-buy.